Search.terraarcade.com is a webpage that has an interface of a search engine. At the top, you are introduced to a pseudo toolbar with links to gaming websites, and you also can see a search box. In the center of the page, you can find a search field, and below that, a list of links to third-party websites. Some of these are popular, while others are not. According to our research team, Polarity Technologies Ltd. is the creator of this suspicious search tool, and this company is very well-known because it stands behind Doppler Weather Radar, Search.searchjsmtmp.com, I Need Directions Now, and many other suspicious extensions and search tools that we classify as potentially unwanted programs (PUPs) and browser hijackers. 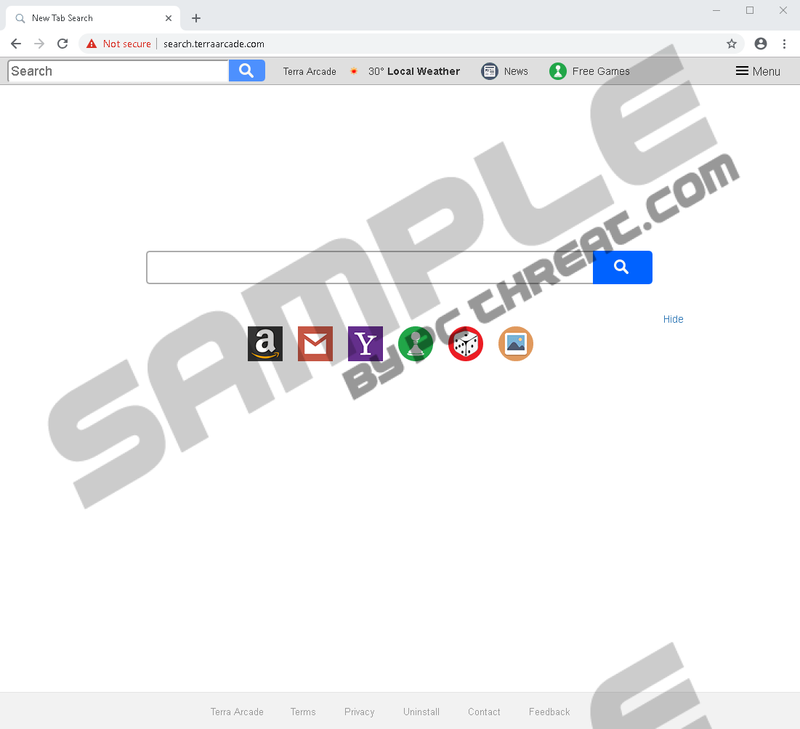 In this situation, we do recommend removing Search.terraarcade.com as a hijacker, but we could not confirm if a unique extension is associated with it. Most likely, however, you will need to eliminate an extension (on Chrome/Firefox) or uninstall an app (for IE users) to get rid of this hijacker. Although it is most likely that Search.terraarcade.com is introduced to Chrome, Firefox, and Internet Explorer users attached to some extension or application, and official download page for this software does not exist. The hijacker certainly is unlikely to spread on its own. Our research team is warning that malicious InstallCore downloaders could be used to spread it, and it could be attached to anything. Of course, more desirable extensions or programs should be offered. Advertisements and pop-ups could be used to promote it too. Overall, Search.terraarcade.com was built to promote terraarcade.com, which is a website for online games, and so gaming apps/extensions are likely to be involved. You might even be pushed into letting the hijacker in when you try to play certain games on this website. Regardless of the situation, if the hijacker got in, you need to scan your operating system immediately because there is a good chance that you need to delete something bigger. Hopefully, when you remove the extensions and programs that deserve it, the hijacker will disappear too. Unfortunately, Search.terraarcade.com might seem like a genuinely useful tool for some. It presents easy access links to gaming websites (e.g., terraarcade.com, bigfishgames.com, addictinggames.com, or minecraft.net), as well as generally popular websites (e.g., amazon.com, audible.com, login.yahoo.com, facebook.com, or gmail.com). This might create an illusion that the hijacker is trustworthy. Although the links might work, that does not mean that Search.terraarcade.com is trustworthy. Our research team has found that the search tool is NOT trustworthy. It redirects to search.yahoo.com, and although this search engine is legitimate, the results shown to you can be modified. That means that sponsored links and advertisements could be shown, and we are sure that you want to avoid those. After all, no one knows what kinds of parties could be using the hijacker as an advertising tool, and what kinds of intentions they might have overall. To make the lives of advertisers simpler, the creator of the hijacker also collects data that is then shared with these advertisers. This is why you should delete the hijacker. As we mentioned already, it is most likely that you can delete Search.terraarcade.com by eliminating the extension or application that is directly linked to it. This is why we have created a removal guide that shows how to uninstall undesirable apps from the Windows operating system and how to delete undesirable browser extensions. Hopefully, you can manage on your own. Unfortunately, even if you get rid of the hijacker now, no one can guarantee that your system and browsers will be threat-free or that you will evade threats in the future. For that, you need to implement reliable security software. Install it now, and you will not need to deal with the removal of Search.terraarcade.com at all. If you need further assistance, do not hesitate to leave us a comment below. We are ready to help. Enter control panel and then click OK to access the Control Panel menu. Open the browser and access the Add-ons Manager menu by tapping Ctrl+Shift+A keys. In the Extensions menu identify the undesirable extension and click Remove. Open the browser and enter chrome://extensions into the address bar at the top. Quick & tested solution for Search.terraarcade.com removal.